Chain Drum Lifter. 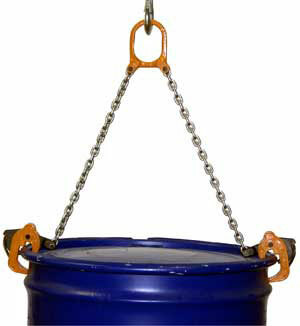 Designed for easy drum lifting and transporting operations with an overhead lifting device. Constructed of grade 80 chain for OSHA & ANSI compliance. Easy to use design. Drum clamps include spring-loaded latch for positive drum grip. For use with closed head steel, plastic and fiber 30 and 55 gallon drums with a top lip. Specs: capacity 2,000 lbs.